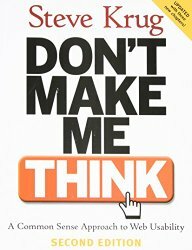 My Rating: 10/10 Don’t Make Me Think – This was one of the first books that I read on usability, back in early 2000s. If you are into web usability and user experience (UX), this is a highly recommended book. It’s one of those foundation books that can set a solid base for someone who is foraying into the field of building usable user interfaces (UI) and user experiences (UX) for the web. Newer 3rd Edition is now available, see details.